NFT provides no medium support for roots. Typically, roots sit in a long sloping irrigation channel (Fig 1.1). Nutrient is introduced at the high end of the channel and allowed to flow over the roots after which it drains into a nutrient reservoir. It is then re-pumped back into the channel to repeat the watering process. This feed cycle can be intermittent or continuous. An ‘intermittent’ feed cycle is regulated by a timer and repeated many times per hour. It is sometimes termed “pulsed NFT”. 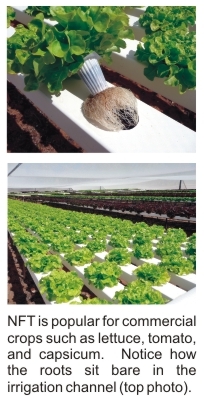 Pulsed NFT usually achieves better aeration of roots because roots are exposed to air between each feed. A ‘continuous’ feed cycle runs non-stop. This is often used in commercial operations. ● Channels need suitable slope for drainage (i.e. gradient 1:40). 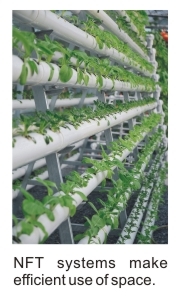 ● Channels must be wide and deep enough to comfortably accommodate the plant’s mature root system. ● Undersized channel’s can become choked with roots which can lead to damming, overflowing or create stagnant areas that fail to drain fully. ● The last plant should be positioned well upstream of the drain’s outlet so that roots do not block the drain. ● Growth problems can occur as the channel length increases. For example, commercial NFT systems often use channels that are several meters long e.g. 5-10 meters. Plants at the head of these long channels often perform better than those at the ‘outlet’ end. Keep this in mind at the design stage. The threshold length will depend on factors such as the type of plant being grown and the nutrient strength. Note that increasing the nutrient flow rate will help alleviate these problems. ● Lower water and nutrient consumption. ● Avoids the supply, disposal and cost problems associated with media based systems. ● Relatively easy to disinfect roots and hardware compared to other system types. ● The absence of medium makes it easy to inspect roots for signs of disease, feed adequacy, etc. ● Regular feeding (and associated flushing) prevents localised salt build-up in the root zone and maintains uniform root zone pH and conductivity. ● Environmentally friendly - minimal potential for localised groundwater contamination. ● Pump failure can result in plant death within a few hours, especially in hot weather. ● Not suitable for plants with large tap-root systems (e.g. carrots). ● Compared to run-to-waste systems, it is less suitable for saline (salty) waters because the salinity of the recirculating water gradually increases.